Studio culture can be characterized by the rituals it preserves and celebrates. Students’ survival of critique rituals that focus on inadequacies of their work, have become a proud rite of passage in design education. The critique legitimizes a novice’s passage in obtaining elite membership in the design community. The glorification of the critique as a designer’s rite of passage, socializes students in a fraternity type culture that prides itself on personal sacrifice. 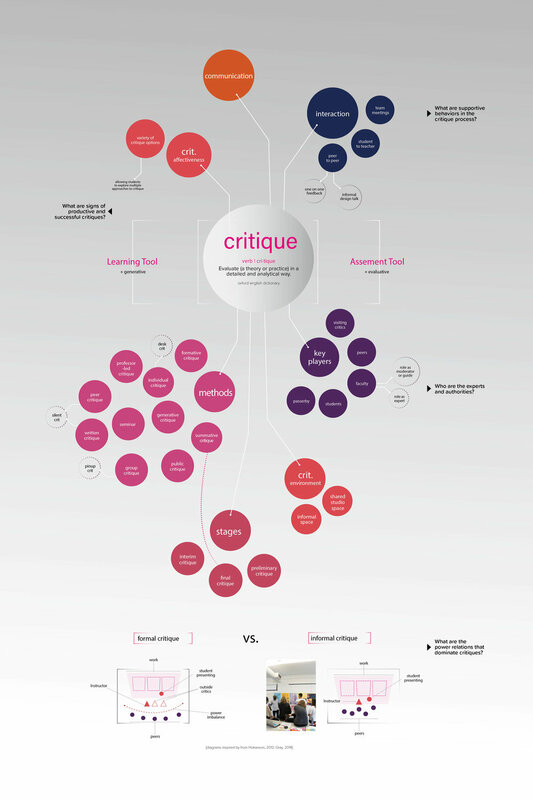 Critique is a vital pedagogical tool in design education. In my study, I’m not questioning the value of criticism, but instead, I'm asking how critique can productively teach and evaluate student work. As a strategy to complexify the studio environment dynamic, my project questions critique rituals as they exist in graphic design practice. By aggregating varied and emerging methods, through a taxonomy of the critique, I try to uncover gaps where design can disrupt antiquated frameworks. In diagramming critique methods as they exist today—I intend to prompt a larger discussion on how social, spatial, and artifactual relationships can have a significant impact on this process. Additionally, this study aims to expose habits, norms, and standards in the studio culture by giving agency to students to choose the format and environment of their critique. Subverting formal hierarchies will shift and renegotiate actors, performances, spaces and standards in a design studio critique.